What Does Fake News Mean for Content Marketing? This Week in Content Marketing: What Does Fake News Mean for Content Marketing? In this very special Thanksgiving episode of This Old Marketing, Robert and I meet up and discuss the big news of a partnership between MXM and C3, which sets the stage for an international content marketing mega-agency. Facebook continues to have problems with fake news, and we explore the potential impact on brands. Facebook also comes under fire for some big measurement issues in our rants and raves, then we dig into a meaty example of the week from Butterball. MXM and C3 unite to form a content marketing super-network (06:34): Two of the world’s largest content-focused agencies are teaming up to address the increasing demand for a single strategic solutions provider that can handle both content development and delivery. According to PR Newswire, The Global Content Marketing Network will focus on three core areas, including centralized strategy and execution on an international scale. While we agree it’s a smart move from a competition standpoint, we wonder how they will differentiate on setting strategy. Facebook admits it has a misinformation problem (14:18): Facebook has responded to widespread criticism of how its News Feed algorithm disseminated and amplified misinformation in the wake of the U.S. presidential election. As reported in TechCrunch, multiple commentators have called out the social network for enabling bogus stories to proliferate — a hugely irresponsible oversight given the role Facebook now plays as a major media source. Among the issues it raises in our minds is whether the level of rigorous fact-checking being called for would even be feasible and, if so, how it would impact content marketers. 7 new podcast facts and stats for 2017 (23:03): Convince & Convert’s Jay Baer shares some of the compelling data revealed in a recent podcast study conducted by Tom Webster and Edison Research (in collaboration with the IAB). 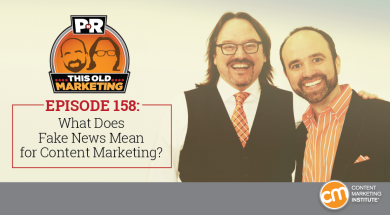 Listenership is up, and with it comes increased legitimacy of the format as a content marketing vehicle. The stat I found to be most notable was that 25% of people follow brands on social media, yet 47% follow brands through podcasts, raising the question of whether social media could be losing its content marketing dominance. Facebook examines loyalty in a time of infinite choice (28:04): Our second Facebook story of the week comes directly from the company’s insights blog and examines some of the more compelling findings from its recent survey on brand loyalty across several key marketing verticals. Robert was encouraged to see “content experiences” among the factors influencing loyalty, while I see a big question being raised by the results: How can marketers create a big experience after the sale? Intelligent Content Conference. If you are serious about putting content to work in your business, you won’t want to miss this event. Learn how to set your content free from the copy/paste mentality and move toward a more agile, modular, and scalable approach to content creation and distribution. Early-bird rates fly away on December 17, 2016, so register today. Robert’s rave No. 1: A recent McKinsey article offers a comprehensive, step-by-step guide to making your marketing organization agile, including how to put the teams and capabilities together to make it scale. Robert has increasingly been leaning in to the idea of agile development, and this article lays out the concept and key processes convincingly and compellingly. Robert’s rave No. 2: I highly recommend that content marketers download and read the 2016 Gartner Hype Cycle for Digital Marketing and Advertising. Among the highly valuable information it provides, I was particularly encouraged to see how Gartner defines our discipline, as well as how its analysts provide a clear and well-detailed discussion of its pros, cons, challenges, and opportunities. Joe’s rant: As we were recording, news broke on The Drum that Facebook discovered some additional faults in how its systems calculated some of the metrics coming from Instant Articles, video, referrals in Analytics for Apps, and Page Insights. Though Facebook is now vowing to be more vigilant and transparent with its metrics, I see it as an additional reason for marketers to diversify their platform and move away from relying on “rented” channels like Facebook. Joe’s rave: This MarketWatch article describes some encouraging effects Donald Trump’s “war on media” is having on news outlets: It seems to be increasing their paid subscription numbers, as well as the number of donations they are receiving. Though I’ve talked at length about how subscription-based business models may not be long for the journalism world, I’m thrilled to see a surge in consumer support for credible news media — even if it may only be short-lived. With the American holiday of Thanksgiving coming up once again, it’s time to talk turkey. One of the biggest names in providing and preparing a boast-worthy holiday bird in the U.S. is Butterball. 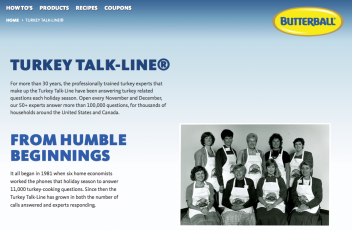 For more than 30 years, Butterball has offered a toll-free Turkey Talk Line, where trained turkey experts stand by to answer consumers’ questions, recommend recipes, and offer tips on cooking times, preparation steps, and more. This year, Butterball has announced that it’s expanding its Turkey Talk platform to provide on-demand assistance 24/7, via text messaging. By consistently evolving and improving its content platform aimed at easing the stress of entertaining friends and family over the holidays, Butterball keeps its customers feeling fully supported — and keeps its brand firmly entrenched in the culinary conversation. It’s a This Old Marketing example that those of us who aren’t “master turkey chefs” (like Robert) can be thankful for.